Why do my settings change on their own? I'm emailing to let you know that one more incident and i will be cancelling my Jotform account and going with a different solution. You have a great product, but it seems every 2 months my clients are complaining about non-functioning forms. I go in and check and sure enough, the email notification settings are broken and missing. I'm the only one with access, this isn't some mystery. Periodically the Jotform settings change on their own and I don't know until my client has already lost money! Not acceptable. I understand. Apologies for the inconvenience. This is actually a first case that I encounter that settings in the email notifications changes. May we know what specific problems or errors are you getting and to which forms? I check the form titled "Chill Comment Form" and I see that there are around 20 notifications and half of them are conditionally setup. It would help us a lot to know more about the specific errors and problems, example, are the recipient addresses resets? The sender email" Or something deletes itself? If your client does not receive email notifications, there are quite a few factors that that may happen. -> The email service provider for the recipient address started to block our JotMail IP addresses and domain name servers, this happens when the recipient address notices a number of emails coming from one source with the same format, thinking that it is spam and will start to block the source without any notice. 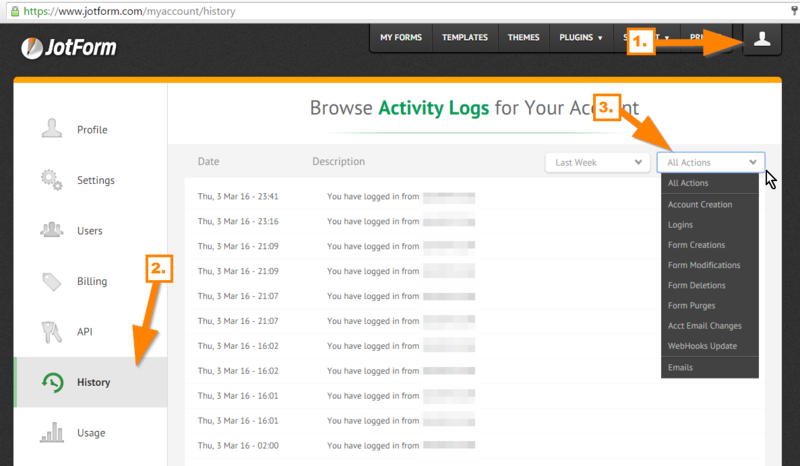 -> You can check your activity log to see the changes made by your account. You can see if there's an unnecessary access or actions made. So far, we have not yet receive similar reports. But our developers does have some updates making under the "Emails" wizard, although I am not sure if that should affect the settings of our users. Apologies for the inconvenience. Well we have several forms set up and on each form the user can pick their store location. Once they hit submit, the form is routed with conditional statements. For a long time, these worked just fine. Then i noticed that when you guys started updating and upgrading your systems, we would lose some conditional statements. All of the emails stay intact, but the conditions go all screwy. I go in and fix, then several months later when you guys do another change, my conditions go haywire again. Apologies. 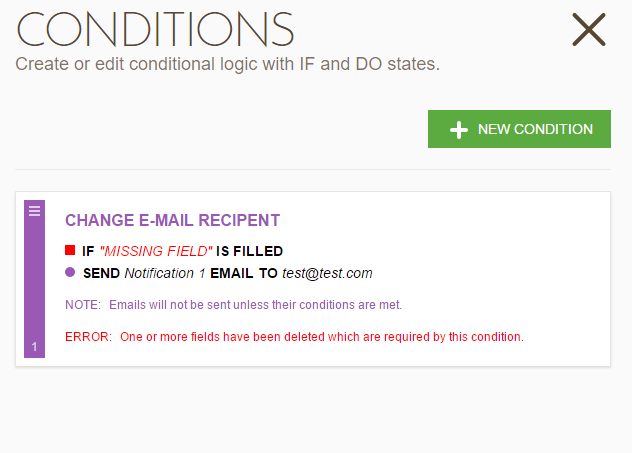 Our developers are indeed implementing a new module in the "Conditions" feature. It is continuously being updated to improve the performance and fix the errors. There's a possibility that that may be the caused of the problem, although I am not entirely sure of it as this is the first time I encounter the problem. I can forward this problem to our developers, but we'll need additional information from your end to have it investigated, like a screenshot of the actual problem. For now, would it be alright to monitor your forms, then if you encounter the said problem again (assuming that you did not make any changes on the forms and suddenly there are errors on it like missing fields and the likes), please do let us know immediately here in the forum and we'll forward it to our back-end team.